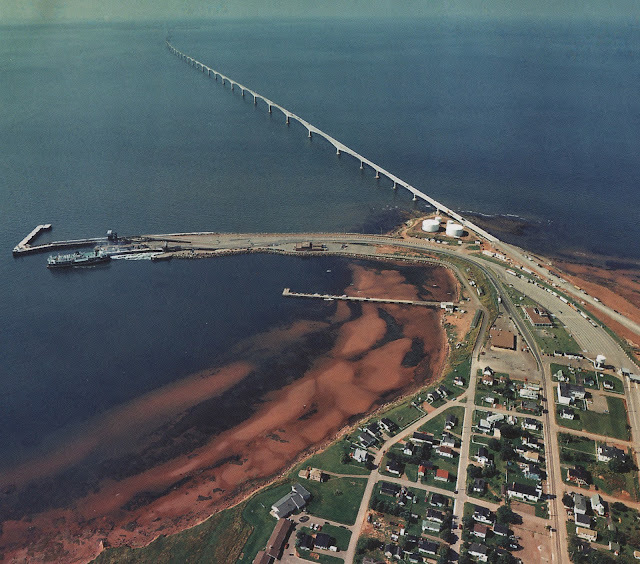 Writing last week about the Strait of Kerch Bridge reminded me of the Northumberland Strait (Confederation) Bridge. The Strait of Kerch Bridge is 19 km long and will cost about $4 billion. The Strait of Northumberland Bridge is 12.9 km long and cost about $1 billion. The Kerch Bridge connects the Russian Federation to Crimea and the Northumberland Bridge connects the Canadian mainland to Prince Edward Island. 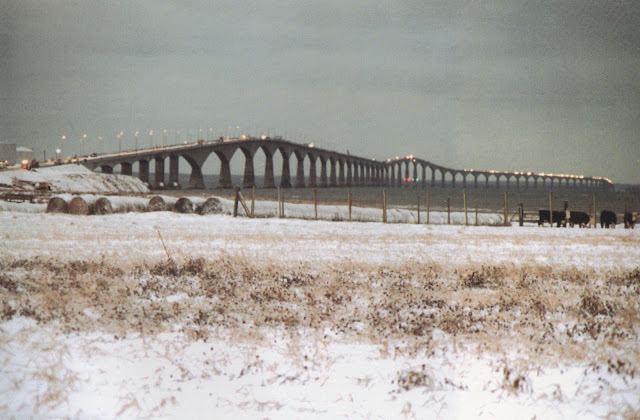 But what made me think of the Northumberland Strait Bridge in relation to the Kerch Strait Bridge is that they both must resist ice floes during the winter. 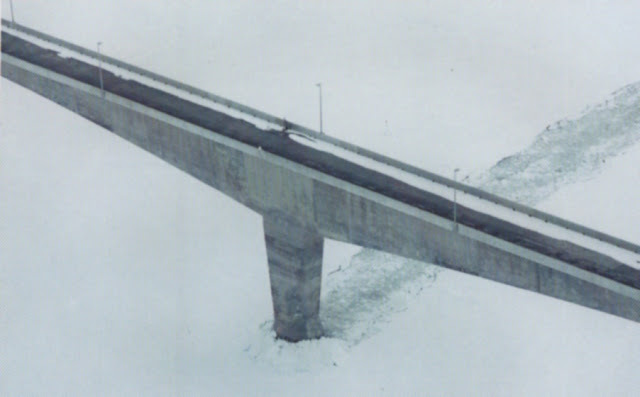 In fact, the Northumberland Strait Bridge was specially designed to break up the ice floes while resisting their force. In the photo below we can see the ice being broken up as it moves past the bridge pier. 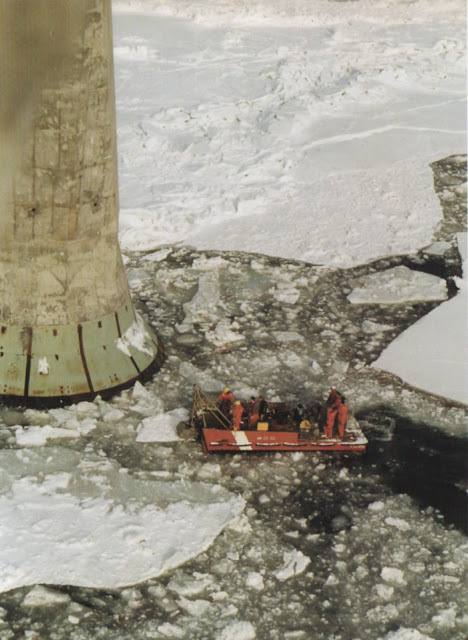 In the next photo we can see the bell-shaped ice shield with steel plates to protect it from the ice floes. The shape of the shield forces the ice to move upward so that it breaks into pieces and flows around the pier. In this photo a research team is visiting the pier to measure the thickness of the ice. Most of the photos, drawings, and information for this article came from the well-written 'Bridging the Strait' by Copthorne MacDonald. We can see in his drawing (shown below) that the ice shield is built at the water's surface (while the bottom of the pier may be 100 ft below). The superstructure is composed of match-cast single box girder segments and drop-in spans. The bridge was designed by Jean Muller International and checked by Buckland and Taylor. A navigational span was built to allow ships to pass under the bridge. The bridge was completed in 1996 and has resisted the ice floes for over 20 years. Hopefully, the Kerch Strait Bridge will have a similar record of accomplishment.